The holidays are fast approaching and with company coming, now is the time to make your foyer welcoming! From crystal lighting or a modern ceiling fan to pendant lights, lamps and sconces, the lighting for your foyer and entryway can enhance your favorite decorating style. HGTV’s foyer lighting slideshow provides some great ideas for starting your project. Some decorating styles that are used for today’s on-trend foyers include eclectic as well as rustic, modern, contemporary and traditional. For a Zen-like foyer, try an entryway with track lighting that highlights specific areas where plants or art may be strategically placed. Subtle, warm colored bulbs are key for this style. Sconces that are rich in golds or amber colors are another way to warm up a space and create a soothing entry way. One idea for a modern foyer is to use silver pendant fixtures. These sleek lights are a great way to create interesting focal points and ad an art-like feel to your entryway. Drum shade chandeliers are also a very beautiful modern trend right now that can be perfectly paired with pendants. Accentuating your space with large, rustic chandelier may not be a bold statement everyone is willing to make but when done right, this can be a stunning way to welcome guests into your home. The warm wood of lanterns are another option when trying to capture a rustic feel for your foyer lighting. Don’t neglect the outdoor lighting either. A flagstone front porch or patio with rustic outdoor lighting can set the tone for the entire home. Contemporary foyers may be some of the most fun ones to light. This trend is one of the few times you can choose eclectic lighting and get away with it. From colored glass to polished, cut silver drum lighting, contemporary lighting lends itself to the creative home owner’s decorating style. 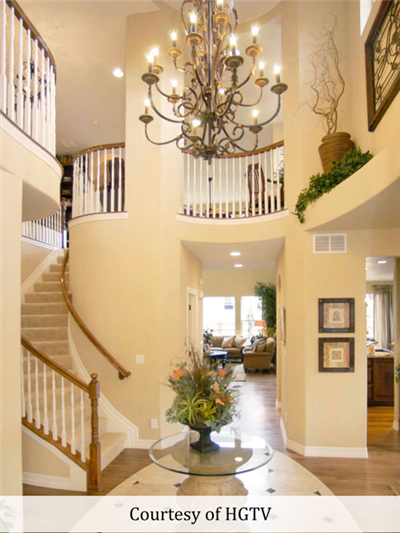 Before welcoming your family, be sure to update your foyer lighting to match your space. It is the perfect way to make a statement before your company even gets the chance to make their way into the rest of your home. For more lighting tips, please call our lighting concierge at: 708-352-2110.